Please make the hearts between 1.5 inches and 2.5 inches (4cm – 6.5cm). The patterns below are free. The finished loop must be 5 inches to 6 inches (12cm-15cm) [not including the tails], for the tags to be connected to. Don’t make it longer than that because a child may try to use it as a necklace which could cut off their air supply if it became entangled on something. bulky to go through the hole in the tags. 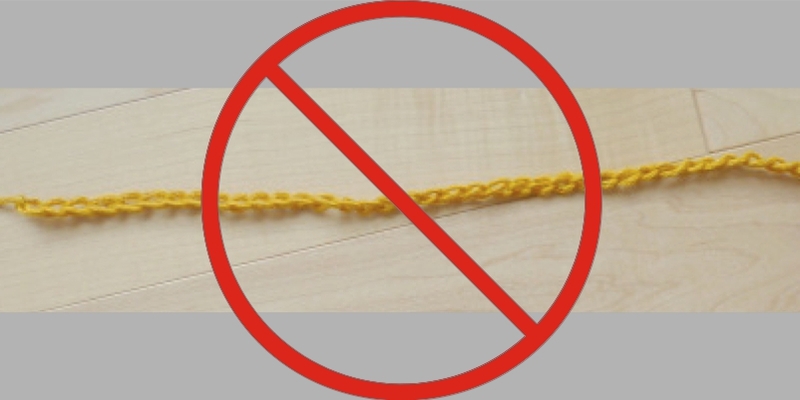 … make a loop with the 2 ends tied together, like the 5 pictured below. … not from the side or from the bottom. 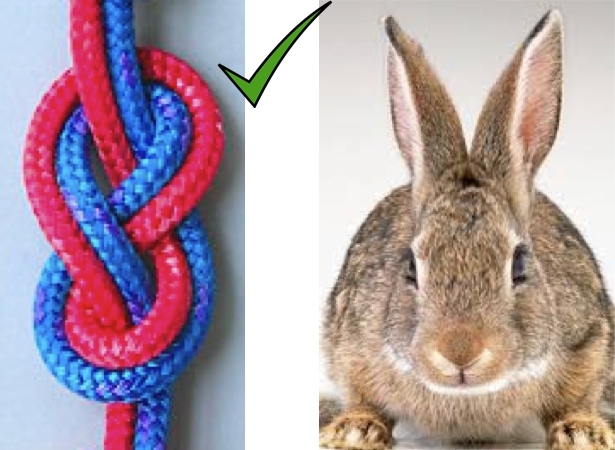 … because it looks better and holds together better than a knot whose ends go off in opposite directions, like a granny knot or square knot (think cat’s whiskers). 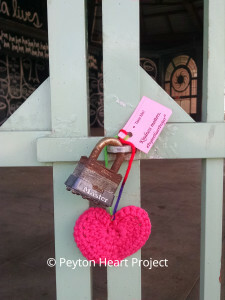 Even if you are not adding tags to the hearts you are sending you must make a tied off loop. If you want more pattern choices you can find them on Ravelry.com. 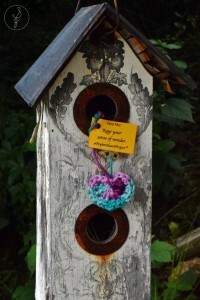 It is a free website for people who knit and crochet. 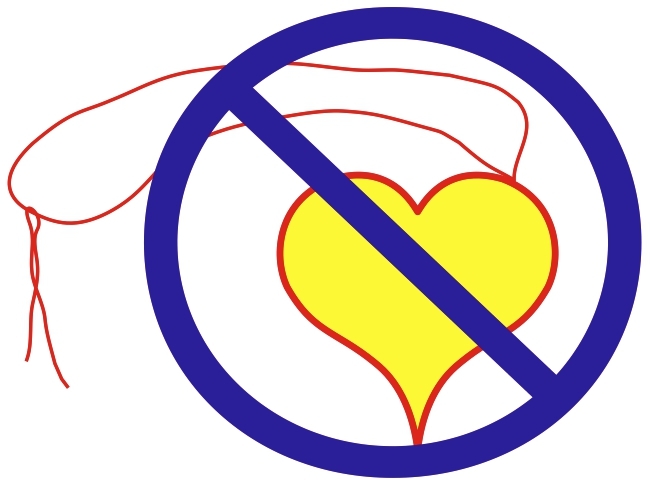 Please, do not attach buttons, snaps, beads, or anything else on a heart that a small child could choke on. Use a K-size hook and chunky/thick yarn to make the heart 2 inches (5 cm) wide. Make a magic loop… Chain 3, In the loop, 3 triple crochet, 3 double crochet, chain 1, 1 triple crochet, chain 1, 3 double crochet, 3 triple crochet, chain 3. 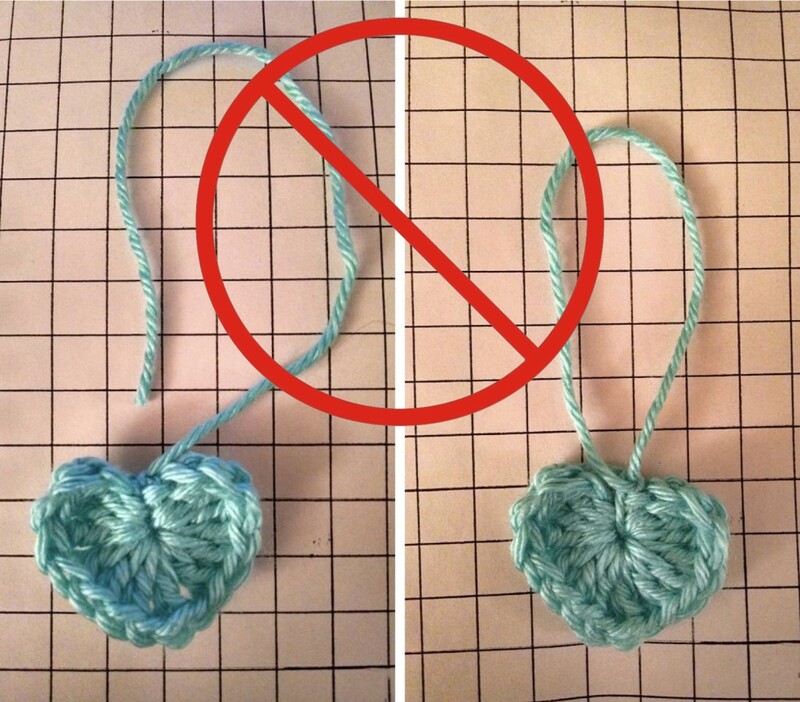 Pull the loop to tighten the center of the heart. Slip stitch in the center of the heart and fasten off, knotting both tail end and working end together at V at the center of the TOP of the heart. Cut both about 5 inches (13 cm). Attach the two ends together with a figure eight knot or overhand knot (not a granny knot or square knot), creating a 4-inch loop to attach the tags to. You don’t have to knit or crochet the hearts. 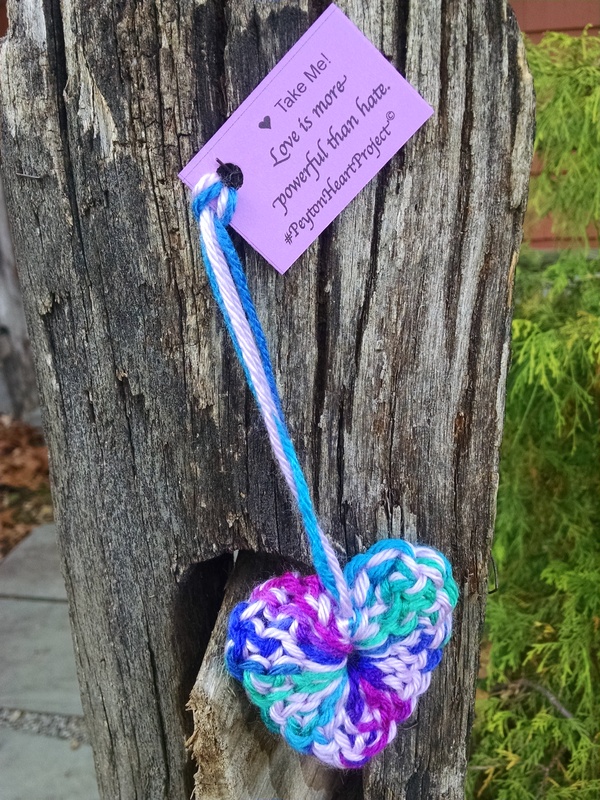 We actually make some of our hearts by wrapping yarn around heart-shaped cardboard. For example, from a cereal box. If you have trouble with the yarn slipping off the rounded edges then you can switch to corrugated cardboard. Here is the simple pattern. Please be sure to leave a 5-inch loop (12 cm) at the top of the heart so a tag can be attached to it. 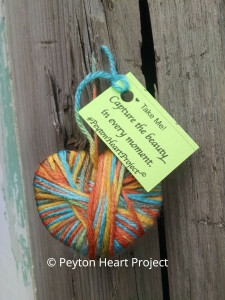 Even if you are not adding tags to the hearts you are sending you must make a tied off loop. 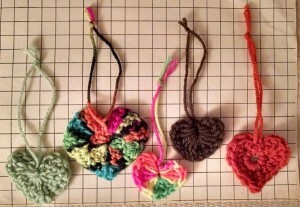 Here is a video showing how to wrap the hearts. It says you can use any color but please don’t use black. Thank you to Don Lawson and his wife, Terry, for creating this video for the Peyton Heart Project. 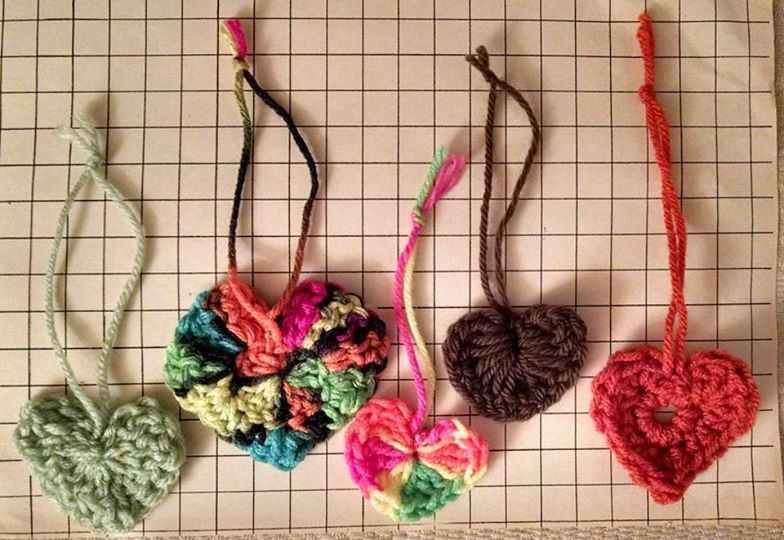 It shows a way to make hearts for us if you don’t know how to knit or crochet. This would be great for kids, too. Please use only thick paper to print out the tags, like heavy duty card stock (65lb). Ordinary printer paper is not strong enough. 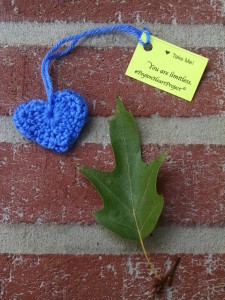 Only tags that are made/authorized by The Peyton Heart Project are permitted to be attached to our hearts. 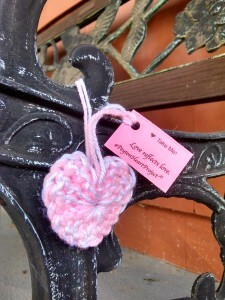 By ordering hearts/tags from us you agree that you will not attach your own tags/cards, etc., and that you will not write on or deface our tags in any way. This includes adding hashtags, numbers, names, websites, etc. A personalized memorial tag file is available from us for a small fee. Please contact us for information. Thank you. Please do not alter the files in any way. This includes changing any quotes; changing the layout; changing the font; changing any colors; adding or deleting icons. If you have an old file that says anywhere on the tag “Sidewalk Smiles”, please discard that file and download a new, updated file. But, please do not insert hearts or tags into vending machine slots or ATM slots or gas pump slots or any other card reader or money slot. It can jam the machinery.